Why do people seem most likely to try and pull the wool over your eyes on Mondays? Luckily, you've always had a strong sense of discernment, and that's part of what's made you successful. Acknowledge that characteristic today by wearing a pair of see-through shoes (PVC panels and uppers on shoes are a huge trend this season). Pierre Hardy's T-strap platform is the quintessential version. It's multicolored purple, blue and brown PVC panels speak to your multi-faceted personality. The multiple metallic straps create a gladiator sandal effect and acknowledge your inner soldier. Meanwhile, the double platform and approximately 5.5 inch heel mean you'll stand tall no matter what. 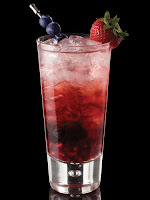 When it's time to unwind after work, ask your bartender for a "Stiletto" (Recipe & image via Marie Claire) The intoxicating brainchild of mixologist, Darren West, it combines RIGHT Gin, pomegranate liqueur, pomegranate blueberry juice, blueberry syrup, orange bitters, lime juice and sparkling wine. It's a sweet-but-tart treat with a bubbly finish. The ingredient list is a long one, though,so give the bartender some creative license. Also, no one respects the authority of a drunk person, so mind your intake.